Understand the duty to manage asbestos in non-domestic properties. Undertake a refurbishment/demolition asbestos survey prior to carrying out intrusive works. We can discuss the likelihood of asbestos in your new home and management options. If you don’t need a full survey we can provide sample results usually within 24 hours. DAF Risk Consulting Ltd was established in Brighton, Sussex in 2012. The aim was to become a trusted advisor to organisations and people requiring information, surveys and testing in the fields of Asbestos and Legionella. The owner and principal consultant Damian Fazackerley BSc (Hons) has over ten years’ experience in asbestos surveying and property risk having worked for numerous companies both in the UK and overseas. 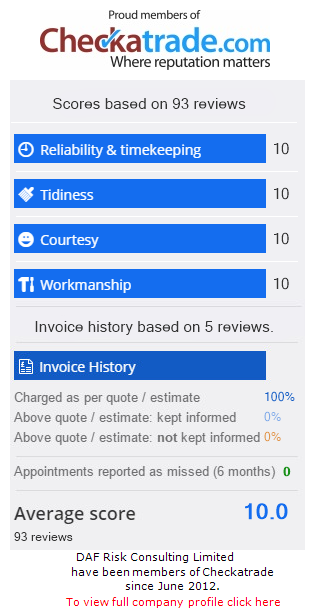 Almost all our work comes from referrals; we have been members of Checkatrade since 2012 and this year became one of the first companies to be endorsed by Which Trusted Traders for asbestos services. DAF are trusted and vetted asbestos experts. Contact us for further info. UNSURE IF YOUR PROPERTY CONTAINS ASBESTOS? REQUEST A CALL BACK & LET US CONTACT YOU. We operate throughout East and West Sussex, including Brighton & Hove, Worthing, Haywards Heath, Burgess Hill, Shoreham-by-Sea and Lewes. We are also able to carry out surveys in other counties including Kent, Surrey and Hampshire. Call or use this form to request a free initial consultation. The DAF surveyor was friendly, professional and courteous. The survey was completed with the minimum of fuss and maximum of satisfaction.